The Ex2000 adds a new dimension to L&T's AC drive solutions. Built to L&T's stringent quality standards. 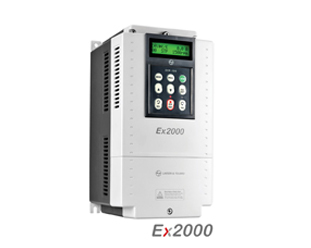 the Ex2000 is tested and certified to meet global benchmarks, thus giving you the assurance of total reliability. 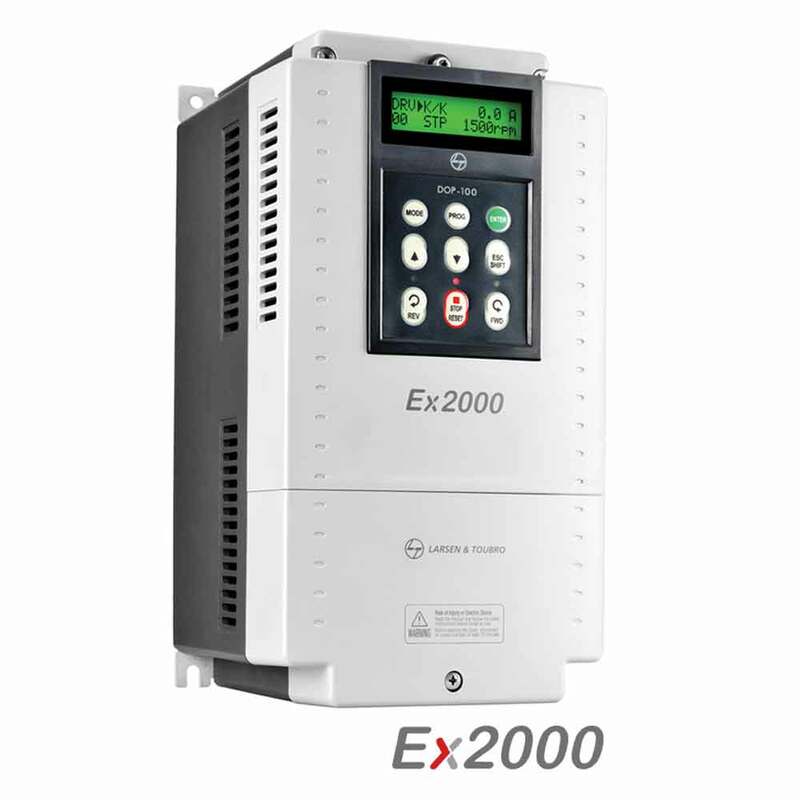 Specially designed for industrial applications, the Ex2000 is perfectly suited for fan and pump applications. It can handle loads up to 450 kW, and is engineered to keep your machine operating at optimum efficiency – even in the hot, humid and dusty conditions that characterize India's industrial environment. It has features that save energy and cost, and is easy to operate. 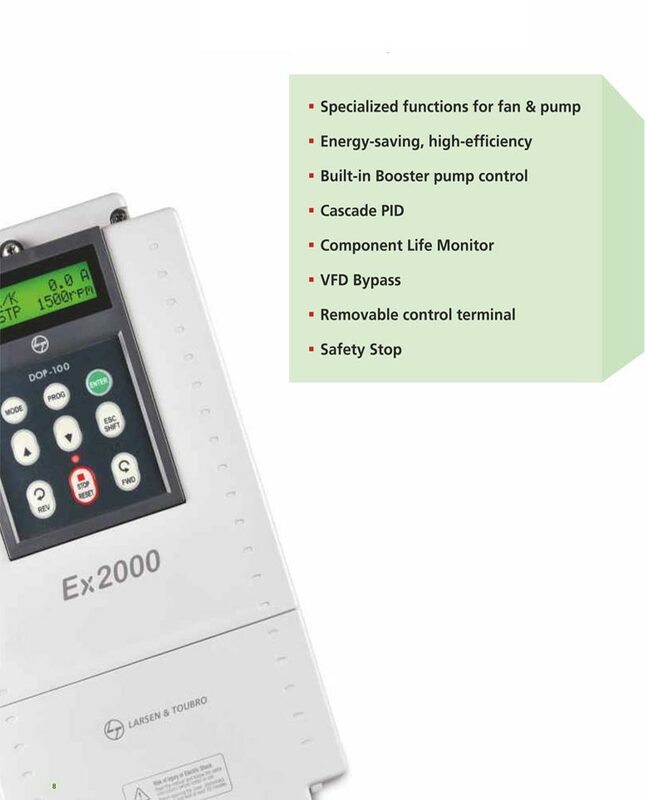 Ex2000 is perfectly suited for fan and pump applications. It can handle loads up to 450 kW, and is engineered to keep your machine operating at optimum efficiency – even in the hot, humid and dusty conditions that characterize India's industrial environment. It has features that save energy and cost, and is easy to operate. It is used when a single drive is used to control multiple motors in pump systems, by default 4 Pumps can be controlled & Max upto 8 pumps can be controlled. Ideal cost effective solution for constant pressure / constant flow pumping application. In the centrifugal fan and pump, PID control is provided as a standard function in order to maintain a constant pressure, flow or level. 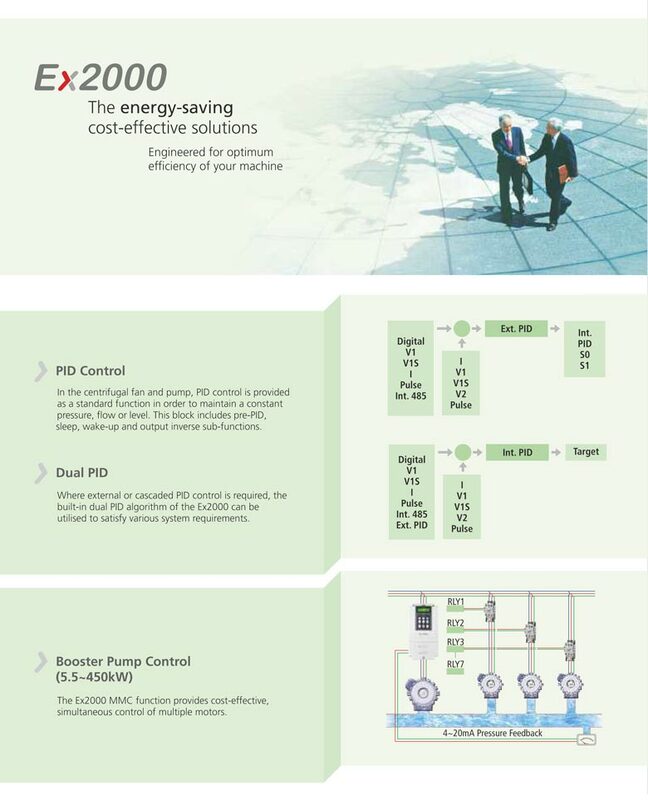 Where external or cascaded PID control is required, the built-in dual PID algorithm of the Ex2000 can be utilised to satisfy various system requirements. It automatically switches OFF Drive during user-programmed low- load conditions and then to start-up again when process demand increases. It helps eliminate unnecessary operation at idle speeds, thus saving wear and tear, as well as energys. Load change may incur energy losses. But the optimised flux control of the Ex2000 results in more outstanding energy-saving. It allows the drive to maintain residual heat in the motor, which helps eliminate condensation in damp conditions when the motor is not in use. In the drive, an adjustable, low-level DC current is applied to the stator windings either continuously or on a duty cycle basis. During power dips or momentary power outage, the drive’s output can be maintained by utilising the residual mechanical energy in the load as a regenerative source. The duration of the power-dip ride-through depends on the load characteristics. In case of AC Drive failure, control card of the existing drive can be replaced to new drive with wiring. Reduces the downtime of AC Drive replacement.